Scooper - Technology News: Research suggests women are happier than men, but is this right? Research suggests women are happier than men, but is this right? One common yet counterintuitive finding in the life satisfaction literature is that women on average report higher life satisfaction than men, even though they’re worse off in many measurable ways. This finding raises the question: are women actually happier than men, or are they just reporting that they’re happier? My job market paper seeks to answer that question. Traditionally, development economics has focused on improving economic development: increasing incomes or reducing poverty. While economic development is a worthwhile goal, there is much to human welfare that economic development alone does not capture. In the last few years, life satisfaction research has received more interest from economists, including from recent Nobel laureates Joseph Stiglitz and Angus Deaton . Life satisfaction research captures more than some of the most popular measures of welfare (e.g. GDP per capita). But, like any measure, it needs to be validated. To do so, I use data from the Gallup World Poll , which interviews people around the world asking them about the things that are important to them, including their life satisfaction, or happiness, overall. I analyze responses from about 46,000 people in 103 countries. On average, when rating how satisfied they are with their present lives as a whole, women put themselves at 2.98 on a 1-5 scale, and men put themselves at a 2.95, for an overall gap of about 0.03. That doesn’t sound like a lot, but it’s actually a big difference: its equivalent to the increase in life satisfaction that comes from moving up their country’s income distribution by about 5 percentage points. In the U.S, that’s equivalent to making $2,000 to $4,000 extra per year. When I control for other characteristics – country, income, employment status, marital status, education level, whether or not the person has health problems, and whether they live in an urban or a rural area – the gap more than doubles. That’s about the same as the increase in life satisfaction from moving up the income distribution by more than a decile, getting an extra $5,000 to $14,000 per year in the U.S. Do women really feel that much happier than men? Gallup interviewers also asked each respondent, “Did you experience the following feelings during a lot of the day yesterday? How about…?” Despite their high overall life satisfaction, women were more likely to say they felt all of the listed negative feelings (pain, worry, sadness, stress, anger), and less likely to say they felt well rested or learned something. Women were also more likely to say they smiled or laughed, and to say they felt respected, although it’s not clear by whom they felt respected – by their children, spouse, superiors at work, etc. What this data suggests is that women’s day-to-day lives include more negative feelings, yet they report higher happiness overall. This could be really what’s happening – any parent (or graduate student) understands taking on extra stress or worry because a child (or dissertation) brings a deeper joy. But women are worse off in many ways that we know make people feel satisfied with their lives: they’re less educated, they have lower incomes, they have worse self-reported health, and they’re more likely to be divorced or widowed. Plus, women have less representation in most governments, face gender discrimination, and are more frequently victims of personal violence. - Think of a female who is 40 years old and happily married with a good family life. Her monthly family income is about [median income]. She has severe back pain, which keeps her awake at night. - Think of a male who is 25 years old and single without many friends. He makes about [half median income] per month. He feels he has little control over his job and worries about losing it. He has no health problems but feels stressed sometimes. The income levels were filled in according to the respondent’s country. On average, women rated all six vignettes higher than men did, by about 0.04 on average – similar to the gender gap in self-reports. In other words, for the same described life circumstances, women gave a higher life satisfaction response. That, in addition to the other evidence that women’s lives are not more satisfying, suggests that women have different reference points when answering the same life satisfaction question, and that perhaps they are not happier than men after all. I test this by “anchoring” every respondent’s scale to one reference scale using the vignettes. The left two scales of the figure below show how two people answer the life satisfaction question for themselves and three vignettes. Maria rates herself in the middle, which for her is between vignettes 1 and 2. Jorge’s self-report is lower than Maria’s, at the same level as he rates vignette 2. 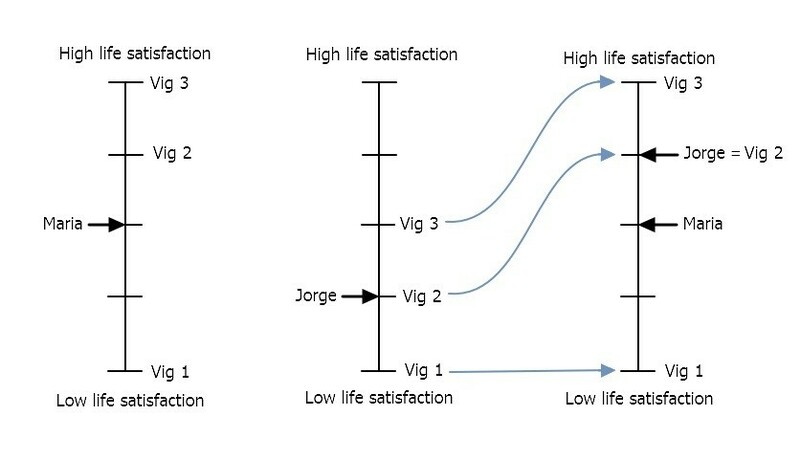 In the rightmost scale, we see where Jorge would have rated himself, if he used the same scale as Maria, based on how they rated the vignettes – and once they’re on the same scale, we see that his life satisfaction is actually higher than Maria’s, despite their self-reports. As long as we can assume that (1) they’re using the same scale to rate themselves and the vignettes, and (2) they interpret the vignettes the same way and agree on which is best, second best, etc., then we can put them on the same scale. The first assumption is straightforward, and several authors have found that it generally holds (e.g. King et al. 2004 , Van Soest et al. 2011 ). I tested the second assumption, and my results show that it also holds. Once men’s and women’s self-reports are on the same scale, we can compare them directly. I find that the previous gap is reversed by about 150% – that is, women are actually less happy than men on average, and the true gap is about -0.015. Before we can use happiness self-reports to measure progress, or evaluate policy (as has been proposed ) we need to be sure we’re measuring what we intend to. This analysis shows that looking only at self-reports leads to a misunderstanding of gender differences. Any comparison between groups – residents of different countries, people with different ethnic backgrounds, etc. – may suffer from a similar bias. Unfortunately, we cannot know what scale differences exist without including anchoring vignettes in surveys. Although it can be costly to add anchoring vignettes, it’s worth the expense to improve the validity of the results.